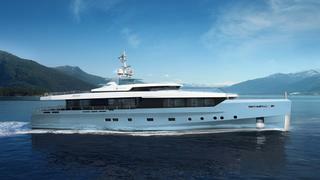 A new-build 40 metre Admiral motor yacht has been sold by Debbie Beere at Dbeere Yachts. Designed by Luca Dini, she is currently under construction in aluminium at the Italian Sea Group to RINA class and is scheduled to be delivered in 2017 as an Admiral Impero model. Her naval platform inherits the high end technical features of the 40 metre Impero yacht Cacos V, ensuring a substantial pedigree for the new build. Boasting a semi displacement hull and an interior by Gian Marco Campaninino, her five generous cabins include an on-deck master suite and two full beam VIP suites along with class leading exterior spaces, and she will be capable of a maximum speed in excess of 19 knots. Overall, the interior design team has expertly blended warm, subtle tones of fabric, leather, wood and marble together with modern and evocative design trends to create a very modern, comfortable and supremely elegant interior space.